Welcome to Winterberry Gardens, the home of Don and Ginny Spoon, thousands of different iris cultivars, and even more numerous seedlings of bearded irises. Both Don and Ginny, and our son Bryan, hybridize irises, and have received top awards with our hybrids from the American Iris Society and the International Competition in Florence, Italy. Please explore our web page and enjoy our photos and articles about our bearded irises grown and developed in northern Virginia. 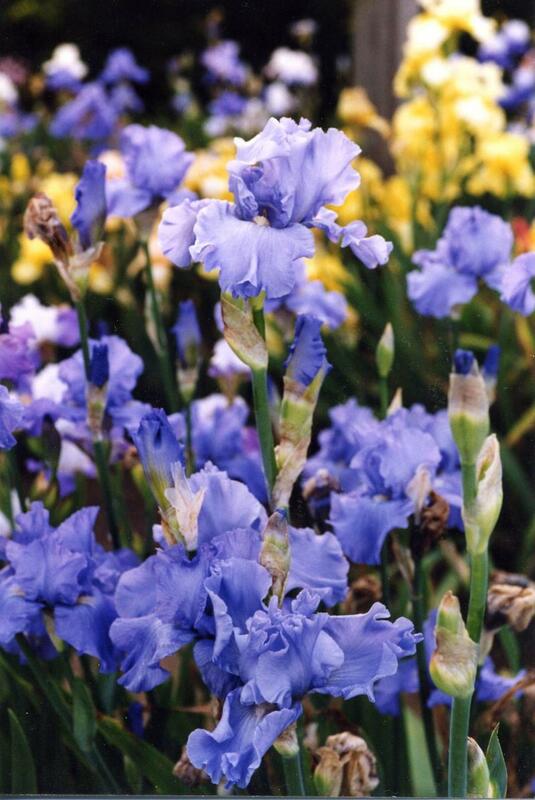 Pictured above is a clump of one of our 2010 introductions, named 'Bluebirds Fly'. We grow, sell and hybridize bearded irises in our northern Virginia garden. Our shipping season is from July 1, through October 15, and gift certificates are available all year. Our current catalog is available for $5 and we hope to have them ready in March of each year. We take orders until the middle of October, but we may be out of some things by then so please have some substitutes on your list. We also offer gift certificates all year and they make wonderful gifts for Mother's Day, birthdays, Christmas, etc. Browse through our listings and photos on the right. To see the description of the irises in the photos just click on the photo. To order you may call us or send us a list with your order.